The orientation boards in the outdoor area of ​​the school buildings provide an initial overview. They provide information about the building positions, their accessibility and coloring. 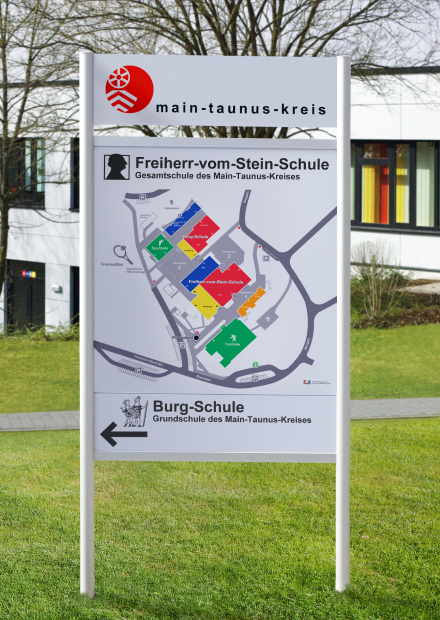 On the school grounds, orientation signs are placed along the access routes, which give the visitor a first overview of the building position and its color division. Furthermore, the access routes on the orientation boards are also shown, in order to clarify the opening up of the school via the outdoor area. It is also possible to characterize barrier-free access, administration, parking, bus stops or lifts on these orientation signs. All other FLS components (door markers, wall markers, entrance markers) are intended solely for orientation in the building interior.